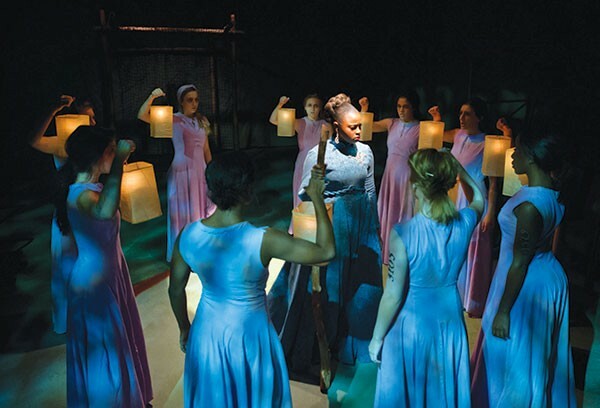 Melessie Clark (center) and the chorus in Point Park Conservatory's Hecuba. Like ouzo, classical Greek drama is an acquired taste that can be difficult to swallow. 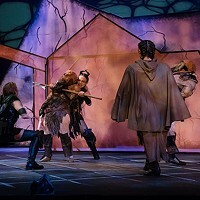 The Point Park University Conservatory Theatre Company has drunk deep of the gods' nectar to produce a pleasing and stirring Hecuba, in the 1992 translation of Euripedes by Kenneth McLeish. Directed by Monica Payne, the student cast moves and chants with unconscious precision, and the intimate black-box staging pushes the passion right into the audience. For those unfamiliar with classical theater, the formalities of long speeches with repetition/emphasis by the chorus can be a bit off-putting. Greek drama is a lot of talk, and all the action — especially the violence — happens off-stage. Characters predict and react. 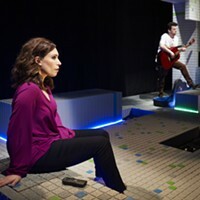 Under Payne's direction, they also writhe, stride and undulate, capturing Euripedes' tragedy into a tight one-act. The play is one of many from the Trojan War. The long-time queen of Troy, now a captive slave to the Greek victors, bemoans her fate, suffers unendurable griefs and wreaks revenge on a dishonorable villain. There is a lot of handwringing about war that is, alas, as timely now as when the play debuted circa 424 BCE. OK, most of the actors don't fit the ages they play, but ignore that: Melessie Clark embodies the regal Hecuba and the sorrowing mother. She moves and speaks as a queen. She gushes pain, and ultimately relishes the triumph allowed her. Perris Drew offers strong counterpoint in the dual role as the ghost of Hecuba's son and then as Agamemnon, her new and likewise doomed master. The 10-member chorus is the best I've ever seen. 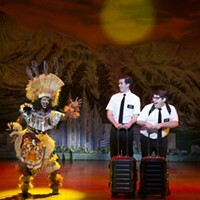 The production is visually rich (who cares about anachronism) thanks to a superb design/tech team: Cathleen Crocker Perry, costumes; Cat Wilson, lighting; Jeff Fuga, set; Steve Shapiro, sound; and whoever came up with the appropriately ghastly makeup for the chorus. Kudos also to Kim Martin, production manager, and Nik Nemec, stage manager. It should come as no surprise that music-theater-trained students would be so well suited to the demanding rhythms and choreography of Hecuba. Get a taste of what has wowed the Greeks for nearly two-and-a-half millennia.